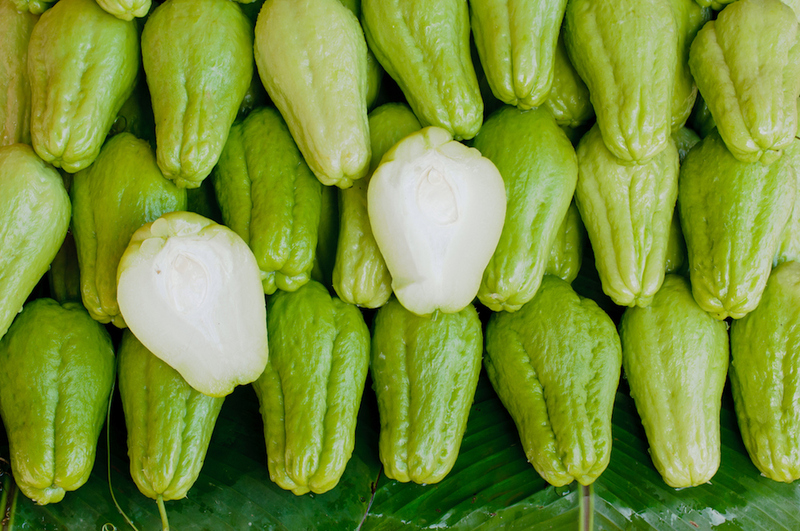 What Is Chayote Squash and How Do You Cook It? Also, how do you even say chayote? It sounds like a furry animal you would see in the desert—but it's definitely not, and that's also not how you say it. Here, everything you need to know about chayote. What are the health benefits of chayote? Similar to other fruits, chayote (also affectionately known as cho-cho) is high in antioxidants and vitamins—specifically vitamin B, vitamin C, potassium, and amino acids. It's super healthy too: One cup of chayote has just 25 calories, only 0.2g fat, 6g carbs, 1.1g protein, 2.2g sugar, and 2.2g fiber. However, a vast amount of the nutrients are in the peel—so be sure to keep it on while cooking and eating. It works well as a replacement for starchy vegetables for anyone looking to cut carbs or who is following a low-carb diet like keto or Atkins. You can eat all parts of the chayote (and probs should—remember the nutrients in that peel), which makes it versatile for cooking and eating. (If you remember the shrimp monologue from Forrest Gump—"you can pickle it, sauté it, grill it, bake it, roast it…"—the same goes for chayote.) Each method will bring out different flavors and textures. For example, grilling caramelizes the chayote due to its sugar content. It is low in sugar but still a fruit. Eat it raw: Chef Saul Montiel from Cantina Rooftop in NYC uses it raw and julienned to add crunch to a salad finished with lime juice, spicy Mexican seasoning (Tajin), and olive oil.